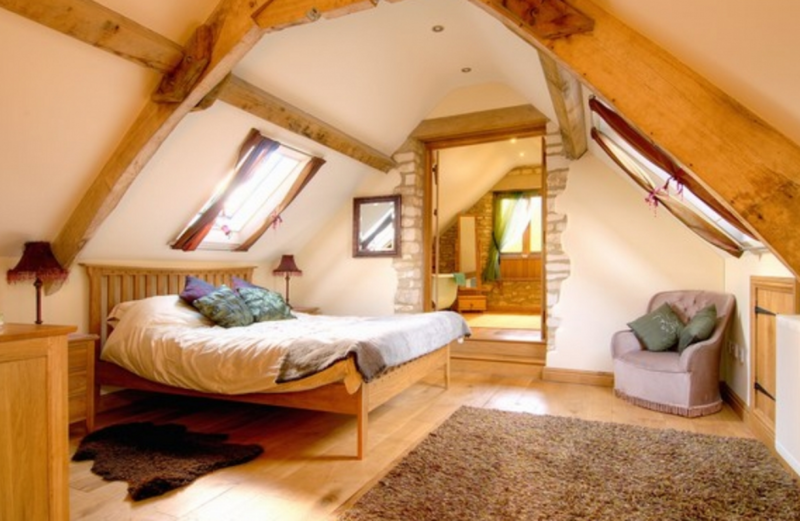 Luxurious and cosy Cotswold converted barn near Cheltenham, ideal for a self catering holiday in the countryside. This cosy self catering converted barn near Cheltenham is the perfect place for a group of friends or a large family to enjoy the many events that Cheltenham has to offer. Why not stay in this fabulous property whilst attending the Cotswold Air Show, Fairford International Air Show or the Cheltenham Races. The barn offers a high quality, luxurious and tranquil home, surrounded by stunning Cotswold countryside. There is a large selection of activities available including some great fishing spots, some warm and cosy public houses and a great local golf course. On the ground floor you will find a small but cosy sitting room with solid oak flooring and wonderful French doors leading out to the country garden. There is also a double bed, wardrobe, chest of drawers and sofa bed. Bedroom one has oak flooring and is luxuriously furnished with a double bed, chest of drawers and wardrobe. Bedroom two offers twin beds, chest of drawers and a wardrobe. There are two bathrooms, each with shower, basin and WC. The stunning dining hall is overlooked by a breathtaking oak gallery. There is a dining table and chairs to seat 12. The hallway boasts a large Cotswold stone Inglenook fireplace, perfect for the winter months. The beautiful, fully-fitted kitchen has a traditional stone floor and includes a large American-style fridge, range cooker and dishwasher and a utility room comes with washing machine and tumble dryer. On the first floor is a spacious, beamed galleried living room with open fire, oak floor and sofa-bed that sleeps two. The Master bedroom has a king-size bed and luxurious en-suite bathroom, with freestanding claw-foot bath, basin and WC. A second bedroom has a classical style double bed. A second bathroom comes with shower, bath, basin and WC. This wonderful converted barn is surrounded by rolling countryside, making this a wonderful place to stay for a walking holiday or for those who enjoy the outdoors. There are nearby golf courses, fishing spots, a dry ski slope and many a good country pub. The nearest town is Painswick, which has a selection of shops and restaurants for you to try. For somewhere with a bit more life, Stroud is less than a five minute walk. If you wish to attend the Cheltenham Festival, the racecourse is just 13 miles away and Cheltenham town centre just 10 miles.